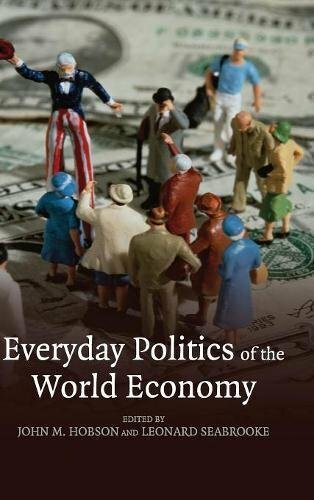 Everyday Politics Of The World Economy: 9780521877725 Hardcover - LIMEROCK BOOKS INC.
How do our everyday actions shape and transform the world economy? This volume of original essays argues that current scholarship in international political economy (IPE) is too highly focused on powerful states and large international institutions. The contributors examine specific forms of 'everyday' actions to demonstrate how small-scale actors and their decisions can shape the global economy. They analyse a range of seemingly ordinary or subordinate actors, including peasants, working classes and trade unions, lower-middle and middle classes, female migrant labourers and Eastern diasporas, and examine how they have agency in transforming their political and economic environments. This book offers a novel way of thinking about everyday forms of change across a range of topical issues including globalisation, international finance, trade, taxation, consumerism, labour rights and regimes. It will appeal to students and scholars of politics, international relations, political economy and sociology. How can our everyday actions contribute towards shaping and transforming the world economy? This collection of original research essays studies a range of actors and analyses how their 'everyday' decisions and actions can affect the global economy.